Ultrafast pulsed lasers are now being adopted as the new workhorse in the processing of materials such as metals, glass, silicon, ceramics and thin film. 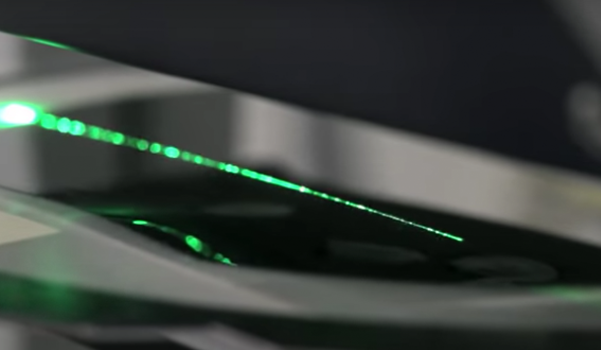 With validated benefits in high yield and efficiency the potential of ultrafast lasers can now be leveraged with the Next Scan Technology. Next Scan Technology – NST – enables best of class material processing through the introduction of novel scanner systems for both legacy and ultra short pulsed lasers. NST offers the widest range of polygon scanner systems: different large area scan fields, different operating wavelengths and small focused spot sizes. The key to Next Scan Technology is a compact all-in-one polygon scanner head, featuring its patented mirror optics providing small spot sizes fully telecentric over the entire scan area. This ready-to-use solution enables exceptional performance through innovative features such as SuperSync Control, TrueRaster Technology and High NA optics. In addition, for the optimum process efficiency, the modular design allows for customization. workpieces – at fine resolutions and with freely definable patterns and structures.